Welcome to The Great Wall, Supplier of PVC Panels Modern Wall and Ceiling Concepts. The company was incepted in 1989 at Ludhiana. Reliable and trusted vendor base make us different from others. Complete client satisfaction, Superior quality products and reasonable prices make us stand apart from also-rans. 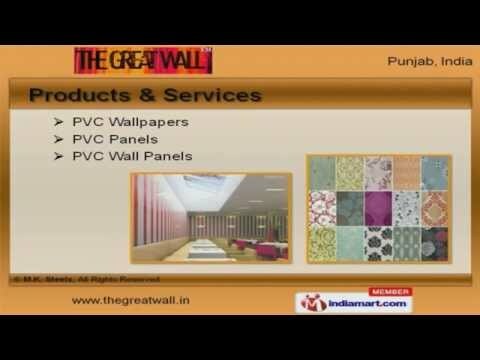 PVC Wallpapers, Panels and Wall Panels are some of our Products & Services. Our PVC Leather Panels and Decorative Wall Panels are best in the industry amongst others. We offer Wood Wall and Ceiling Paneles that are widely acclaimed in the market. Ceilings Sheet and Modern Ceiling Concepts offered by us are available at affordable prices. Along with that we offer Ceiling Services and PVC Panels for Homes that are a class apart. We also provide Decorative Wall Panel for Offices and Ceiling Panel for Hotels that are extremely reliable.